Av. 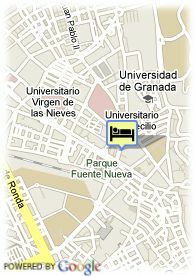 de Madrid, 10, 18012 Granada, Spanje. 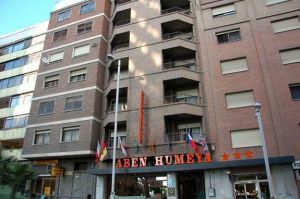 Hotel Aben Humeya is located in the city centre, next to the ancient quarter in the academic and economic area of Granada. With 162 rooms completely equipped, Aben Humeya Hotel also offers you its own laundry service. The Hotel is situated near the Railway Station and very close to the main area of social and economic activities of the town and a pleasant walk will take you the historical centre of Granada (Alcaiceria, Royal Chapel, Cathedral etc.) It is no more than 12 km from the airport. The premises of the hotel is modern and comfortable and also the maintenance is extraordinary. Among other services, it offers, Indoor Parking service at 25 metres. Betalende openbare parking nabij het hotel (overdekt) (16.55 €) (16.55 km).